Purchase this upgrade and I will add a rattle insert to any plush item you order. If you are ordering multiple items and only want a certain item or items to have a rattle added, be sure and let me know which one(s) in "note to seller" when you checkout, or drop me a line using the "contact" button in my shop or profile. 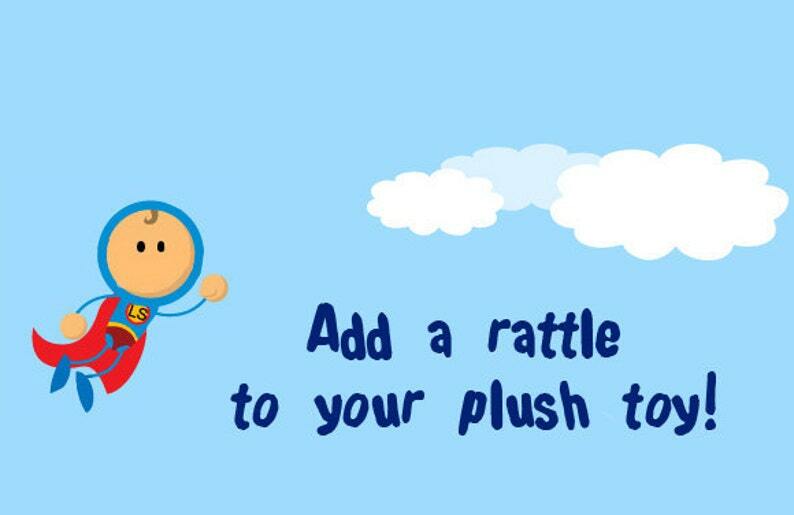 Multiple quantities of this listing can be purchased if you'd like a rattle added to all the plush toys you are purchasing. Rattle inserts are a sealed plastic disc with stainless steel bearings and are machine washable. They measure 1-1/2" diameter x 7/16" thick. If you purchase this listing without purchasing a plush item from me I will send you one rattle insert. Shipping for this item is only charged if purchased alone. Great addition to the stuffies! Add ribbon tags to your elephant's ears.